Here is the latest information as of 10:30am Saturday on our severe weather threat for today. A developing low pressure area will move across Missouri and into the Ohio Valley, dragging a cold front through the Mid-South. Ahead of the front, the atmosphere is destabilizing due to warm, moist air. Temperatures are expected to peak in the mid 70s this afternoon with dewpoints in unfamiliar territory for February - the mid to upper 60s. This means there is plenty of moisture available to feed storms and more than enough instability to cause storm to grow quickly once they are lifted by the approaching front. In addition, strong turning wind from the surface to the mid levels of the atmosphere will allow large storms to rotate, resulting in some supercells. As the atmosphere charges up, scattered showers and a few thunderstorms are likely throughout the day. 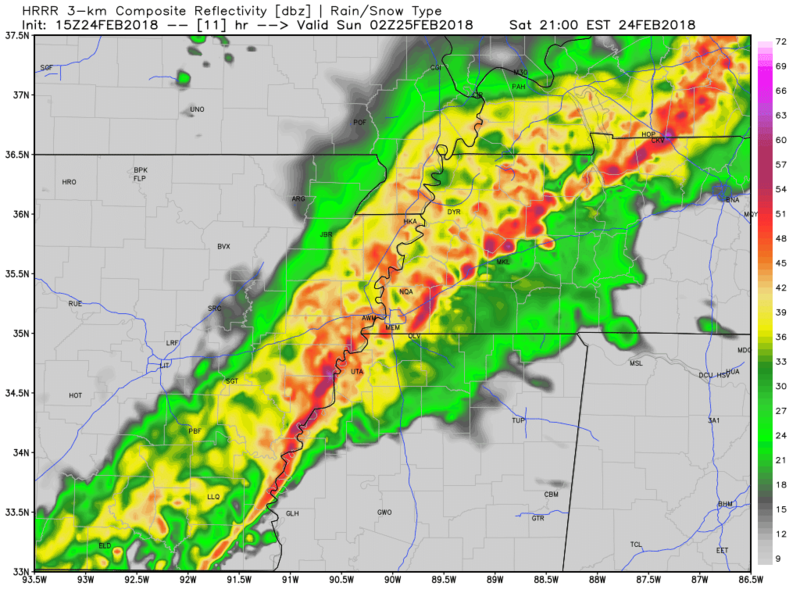 I expect the most widespread coverage to be north of I-40, and perhaps the metro, by mid-afternoon, though we already have some hit-and-miss activity on radar as I type. By this evening, an organized broken to solid line of strong to severe storms is expected to reach the western edge of the metro by about 6pm, moving across the metropolitan area between 6-10pm. There is still minor uncertainty in this timing, but expect storms sometime in that window. Flash flooding: Moderate. Any storms that form today will be capable of very heavy downpours due to the high dewpoints at the surface and abundant moisture aloft. Flash flooding is possible during and after any storm, but especially this evening when torrential rain is expected with the line. Total rainfall amounts will be highly variable by location but prepare for over an inch tonight and additional during the day if you experience additional storms. Damaging wind: Moderate. Particularly with evening storms, wind gusts could easily reach severe limits (58+ mph). Due to the saturated ground, it won't take as much wind to topple large trees. Falling trees will result in power outages. Plan ahead for that possibility. It is also worth mentioning that by late this afternoon and evening, wind outside of storms will also gust to 30+ mph from the south. Tie down anything outside that you don't want to donate to your northern neighbors. Tornadoes: Moderate-low. 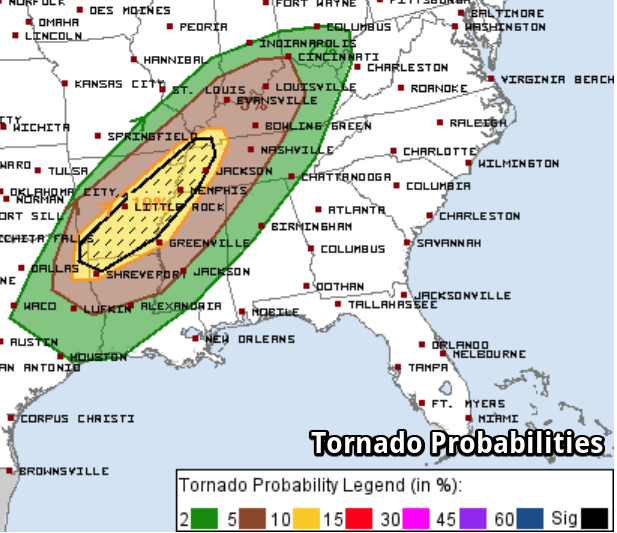 It's been some time since we've had a credible tornado threat. Today is one of those events. The wind shear in the atmosphere this evening will be supportive of rotating supercells that are capable of producing a few tornadoes. Southern and eastern AR into west TN is the prime area where this could occur. I own't call it "likely" that one occurs, but it's possible and you need to prepare for it. 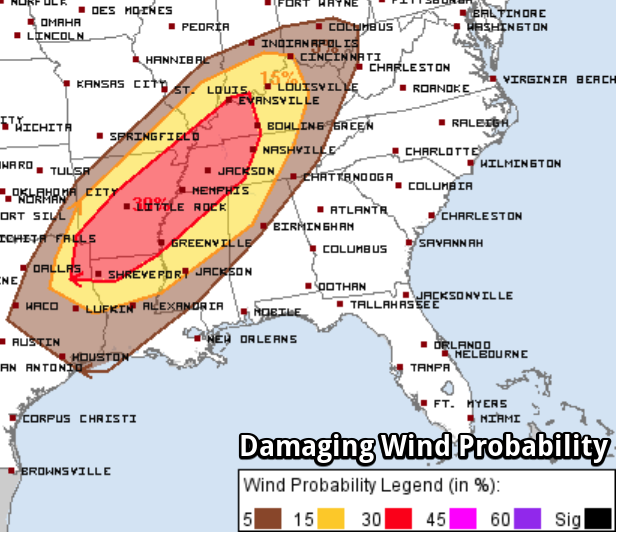 SPC gives us a 10% chance that one will occur within 25 miles of you - low, but well above the "normal storm baseline." In addition, they indicate that a strong tornado or two are also possible. Hail: Low. 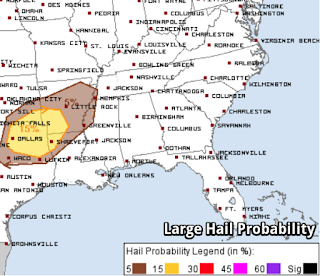 The hail threat is low as there isn't a great deal of super-cold air aloft to cause it to form. 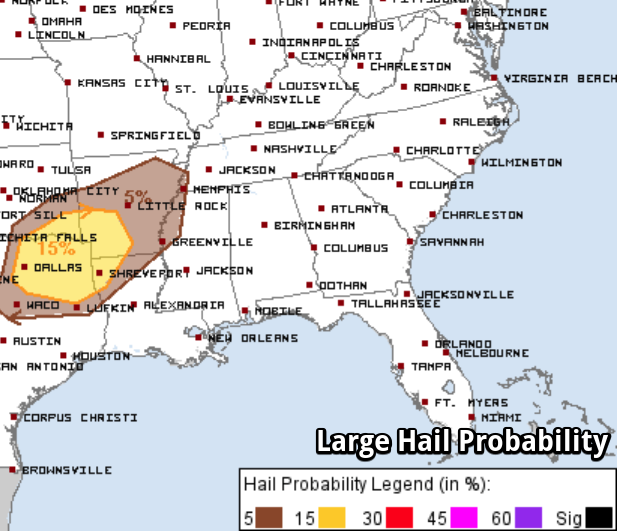 Certainly any storm will be capable of small (pea to dime size) hail, but the threat of large hail is lower than the other threats today. Having a plan ready to put into action and preparing as best you can ahead of time is key. Below are some safety tips to review, particularly since it has been several months since we've had a threat of severe storms. Where will you be this evening and what is the sheltering plan for that location if it becomes necessary to do so? Storms will be moving quickly from west to east - so know the counties to your west if they are mentioned relative to severe storms. In Shelby County, those are Crittenden, Cross, and St. Francis. I expect a Tornado Watch to be issued this afternoon through the evening hours. 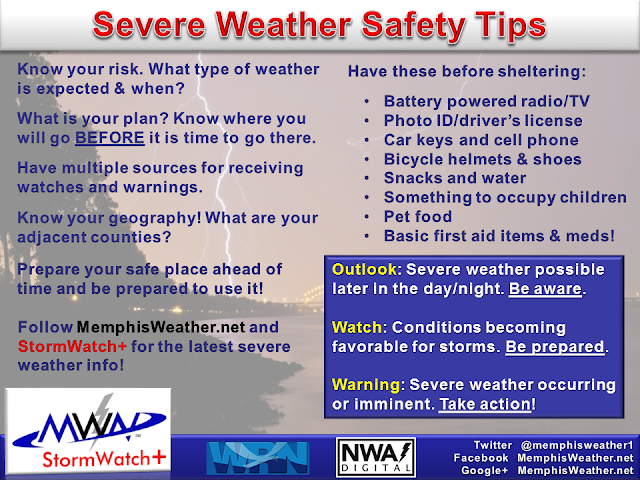 Remember a WATCH means to prepare - severe weather parameters are coming together. A WARNING means to take action - a severe storm is imminent. Charge your phones and other necessary "distraction" or "information" devices. Tidy up outdoors if able - clear debris from storm drains, bring in loose objects, make sure the pets are taken care of. If you haven't already, download the MemphisWeather.net mobile app for the latest info from us. Our Twitter feed has a chronological timeline which will be continuously updated, and you don't have to have a Twitter account to just read it! Within the app, we also highly recommend you activate StormWatch+ for a small one-time charge so that you can get warnings pushed to you, but only if YOUR set location is within the warned area. You select the location(s) and warning types you want to receive! Remember that tornado sirens for Memphis and Shelby County sound all at once for any tornado warning in Shelby County. 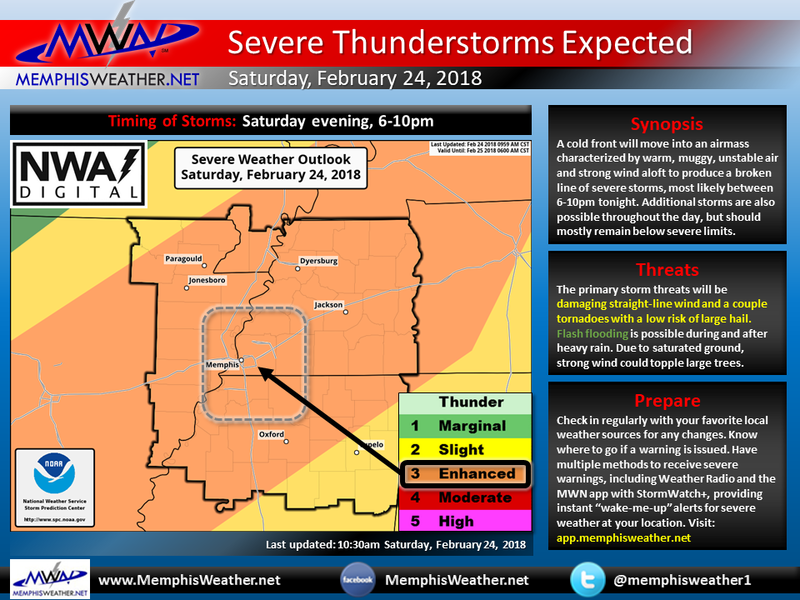 (Bartlett, Collierville, and Germantown: yours sound only when your municipality is in the warning.) Most other counties in the metro also alert based on the entire county. For more on setup of StormWatch+, you can view this video. Finally, be sure to stay in touch with a local weather source today as the forecast could still change a bit and to make sure you have the latest updates. We'll be live-tweeting and Facebooking throughout the event so joins us on social media at the links below. Lastly, we encourage you to "be prepared, not scared!"